It was surreal watching the State of the Union (SOTU) address last evening. The divided nature of our government was obvious. The Speaker of the House was clearly more interested in making a statement of her own rather than listening to the President. 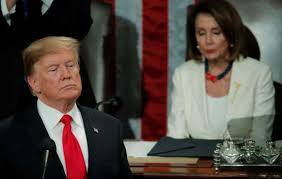 5 key takeaways from Donald Trump's State of the Union speech. I have to admit that at the beginning of the speech, I was encouraged by the bipartisan call, but by the end of the speech it was clear that any bipartisan action would have to be made on the President's terms. The agenda I will lay out this evening is not a Republican agenda or Democrat agenda, it is the agenda of the American people. Many of us have campaigned on the same core promises, to defend American jobs and demand fair trade for American workers, to rebuild and revitalize our nation’s infrastructure, to reduce the price of health care and prescription drugs, to create an immigration system that is safe, lawful, modern and secure, and to pursue a foreign policy that puts America’s interests first. It was interesting to read the Fact Checker of the President's address. He takes credit for many things that began before he took office. The good note is that the good trends have continued, the bad is that he is taking whole credit for them and not recognizing that efforts of Presidents who preceded him. America's immigration system is broken — that's something experts, advocates and politicians across the spectrum can agree on — but there's little evidence the southern border is experiencing a new state of emergency. Violence isn't spilling over the border, and terrorists aren't being caught in droves trying to cross it. Illegal drugs largely come through legal ports of entry, not unguarded parts of the border, according to border authorities. My father has battled prostate cancer for years. To help cover the costs, I found myself sinking deeper into debt -- because while you can defer some payments, you can’t defer cancer treatment. In this great nation, Americans are skipping blood pressure pills, forced to choose between buying medicine or paying rent. Maternal mortality rates show that mothers, especially black mothers, risk death to give birth. And in 14 states, including my home state where a majority want it, our leaders refuse to expand Medicaid, which could save rural hospitals, economies, and lives. I have read about people dying because they have been forced to choose between insulin injections and eating. This is wrong. This is not my vision for the America that I have served for my entire adult life. It was an interesting, if not scary evening as the gulf between the parties was on display. As a country and a society we need to do better.